Located between the urban centers of New York City and Boston, the state of Connecticut has been an important center for the visual arts from the early eighteenth century to the present day. Many of the nation’s foremost painters and sculptors were born in Connecticut or drawn to the state’s natural beauty. While the state’s artistic heritage has paralleled the larger development of American art, its artists have responded specifically to Connecticut’s independent spirit, embodied in the mythic “Connecticut Yankee” and the character of its landscape. In doing so, they helped to shape an identity for New England that lingers in the American mind. The exhibition of paintings and sculpture from the collections of the Florence Griswold Museum in Old Lyme, Connecticut, will include a selection of eighteenth-century portraits by Connecticut artists Ralph Earl, John Brewster, and Mary Way as well as early-nineteenth-century landscapes and genre paintings by Frederic E. Church, John Frederick Kensett, George Smillie, Worthington Whittredge, and John Ludlow Morton. The major focus of the exhibition, however, will highlight the history of the Old Lyme Art Colony, its founder and patron Florence Griswold, and the artists who worked there during the late nineteenth and early twentieth centuries. Artists were attracted to Old Lyme because of the quality of light and its ever-changing conditions affected by misty mornings and crystal-clear afternoons. The tidal marshes, grassy farmlands studded with granite outcroppings, and picturesque towns also appealed to artists as subject matter. The Old Lyme Art Colony is often referred to as the home of American Impressionism, the same way Giverny, France, was a summer colony for the French Impressionists. Both towns were and still are tourist destinations. Between 1902 and 1905, Old Lyme hosted summer classes for the Art Students League. 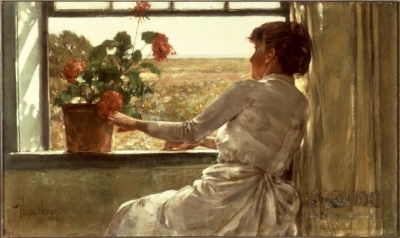 Paintings in this section of the exhibition include works by major American Impressionists including Childe Hassam, J. Alden Weir, Willard Metcalf, John Twachtman, Ernest Lawson, Leonard Ochtman, Charles Davis, Henry Hoffman, Matilda Brown, Everett Warner, Edward Rook, and Emil Carlsen. Many of these artists painted night scenes illuminated by the moon, which became a trademark of the Old Lyme Colony. The final section will include several of these serene landscapes. Photographs of Florence Griswold, the artists, and key sites visited and captured in the paintings will enhance the exhibition.